After an unproductive day on Sunday, Nicole and I decided to make up for it with a busy Monday. We wanted to shop. 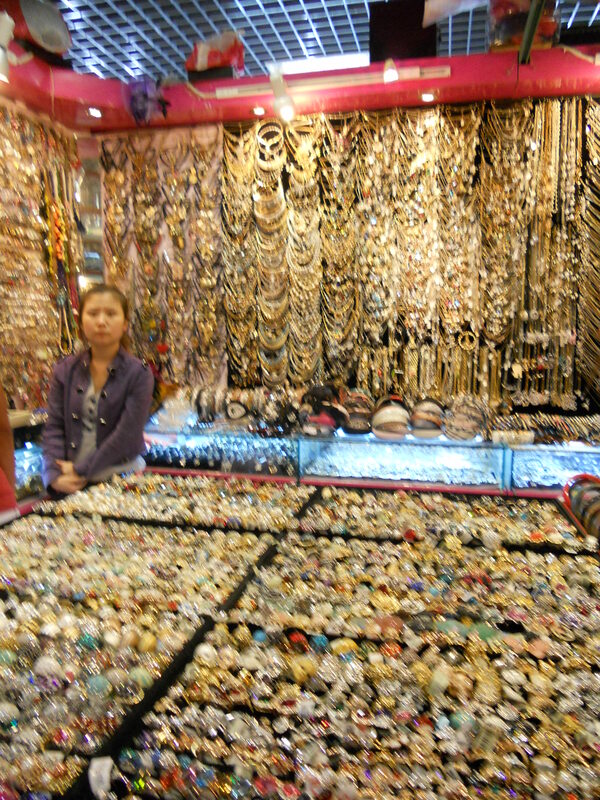 Then we were off to the silk market. We had to take the subway to get there. It was on the subway that we encountered a new phenomenon of China… people with hair sprouting from strange moles. Later we would continue mole-spotting. It seemed to be most common to find them in the subway. This was the most awkward, because when you are stuck between a bunch of Chinese people, sharing a handrail with them, and the person in front of you has a mole on her neck, there is nowhere to escape to. You just have to stare at the mole and hope the subway doesn’t suddenly stop, causing their mole-hairs to graze against your shoulder. We left the subway and passed a homeless woman and her child. We were discussing poverty and homelessness and children born to homeless families as we walked to Starbucks. In front of the coffee shop, we had to walk around a man with enlarged feet sleeping on his side on the sidewalk. Feeling like shitheads, we stepped past him and into the air-conditioned familiarity of Starbucks. After finishing our coffee and sandwiches, we bought a chicken sandwich. We cut it in half and went back outside, retracing our steps. I slipped half the sandwich, wrapped in a napkin, into the dirty hands of the man outside. The other half I ran to the mother on the subway stairs. We watched her open the napkin and offer the first bite to her kid. After feeling slightly better about ourselves, we went shopping. 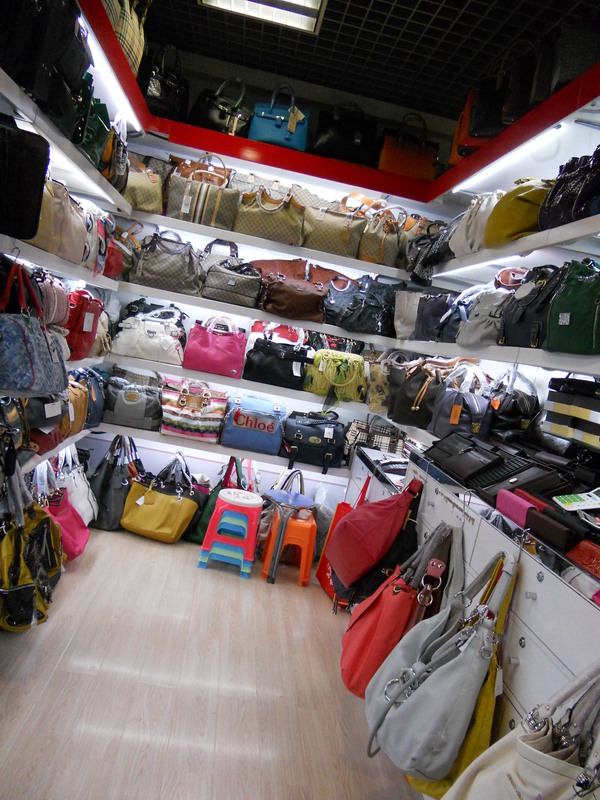 On the ground floor we found a world of knock off Prada, Dolce and Gibanna, Marc Jacobs, and Coach accessories. Nicole bought two purses from one woman. “Please, you buy a wallet? You are very pretty. I have many wallets,” she said. “Um, I’m going to keep looking around. But I’ll come back,” Nicole said. “Why do you need to look? Every store is the same.” We laughed. She was right. We quickly learned the art of bartering. They show you a calculator with a super high number like 350, then turn the calculator to you. You type in a super low number like 40, and they say something like, “don’t insult me. Real price this time, okay? Maximum price.” They suggest 200. You suggest 40. They repeat their comments and ask again for your maximum price. You type in 50. They say, “No. It is impossible. But, just for you, 100. 100, okay?” You shake your head and walk away. They holler after you, “80? 70? …Okay 50.” You go back and pay. “Yes,” she replied. We giggled uncontrollably. And we each bought a set. On a different level, we met a kind salesgirl with a Chinglish shirt. There was a picture of a woman on it. ‘Everyone wants me for my eggs,’ it said beside the picture. “Do you know what that means?” I asked her. “Well, ‘eggs’ in this case are like…” I pointed towards my ovaries. “You know,” Nicole said. “Like every month when you have blood?” The woman slapped her hand over her mouth, laughing and blushing. After all the shopping, we figured we deserved a foot massage. The parlors on each floor offered a 30 minute foot massage for $8. We hadn’t had people touching our feet since that morning, and hadn’t had massages since the night before, so we figured it was time. We left the markets and ordered pizza. We gave the last piece to an old woman who was lingering by our tables and collecting empty soda cans. Feeding the homeless and shopping for imitation name brands. A successful day. You must have been in China too!